On March 14, the ExoMars mission successfully lifted off on a 7-month journey to the planet Mars but not without a little surprise. The Breeze-M upper booster stage, designed to give the craft its final kick toward Mars, exploded shortly after parting from the probe. Thankfully, it wasn’t close enough to damage the spacecraft. Michel Denis, ExoMars flight director at the European Space Operations, Center in Darmstadt, Germany, said that the two craft were many kilometers apart at the time of the breakup, so the explosion wouldn’t have posed a risk. Still, the mission team won’t be 100% certain until all the science instruments are completely checked over in the coming weeks. All went well during the takeoff and final separation of the probe, but then something odd happened. Breeze-M was supposed to separate cleanly into two pieces — the main body and a detachable fuel tank — and maneuver itself to a graveyard or “junk” orbit, where rockets and spacecraft are placed at the end of their useful lives, so they don’t cause trouble with operational satellites. But instead of two pieces, tracking photos taken at the OASI Observatory in Brazil not long after the stage and probe separated show a cloud of debris, suggesting an explosion occurred that shattered the booster to pieces. There’s more to consider. Space probes intended to either land or be crashed into planets have to pass through strict sterilization procedures that rocket boosters aren’t subject to. Assuming the Breeze-M shrapnel didn’t make it to its graveyard orbit, there exists the possibility some of it might be heading for Mars. If any earthly bugs inhabit the remains, it could potentially lead to unwanted consequences on Mars. And this isn’t the first time a Russian Breeze-M has blown up. According to Russian space observer Anatoly Zak in a recent article in Popular Mechanics, a Breeze-M that delivered a Russian spy satellite into orbit last December exploded on January 16. Propellant in one of its fuel tanks may not have been properly vented into space; heated by the sun, the tank’s contents likely combusted and ripped the stage apart. A similar incident occurred in October 2012. For now, we’ll embrace the good news that the spacecraft, which houses the Trace Gas Orbiter (TGO) and the Schiaparelli lander, are underway to Mars and in good health. ExoMars is a joint venture between the European Space Agency (ESA) and the Russian Federal Space Agency (Roscosmos). 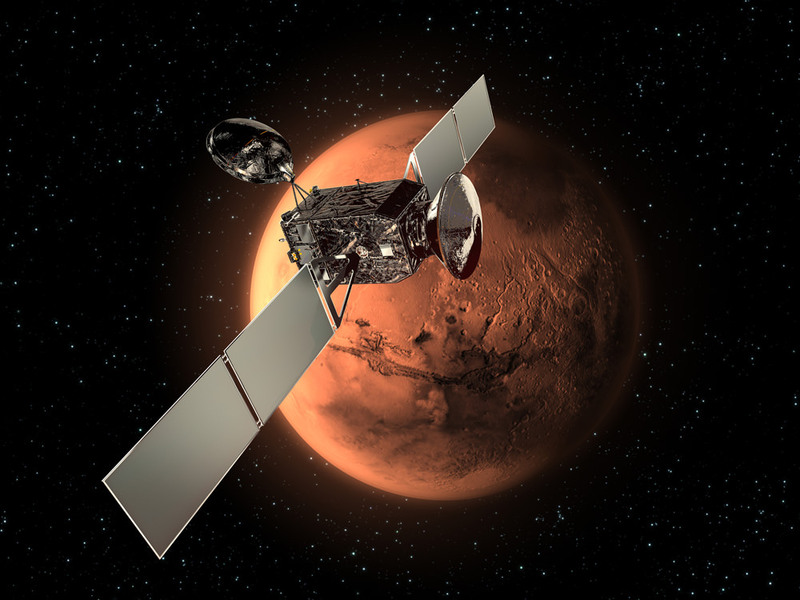 One of the mission’s key goals is to follow up on the methane detection made by ESA’s Mars Express probe in 2004 to understand where the gas comes from. Mars’ atmosphere is 95% carbon dioxide with the remaining 5% divided among nitrogen, argon, oxygen and others including small amounts of methane, a gas that on Earth is produced largely by living creatures. Scientists want to know how martian methane got into the atmosphere. Was it produced by biology or geology? Methane, unless it is continuously produced by a source, only survives in the Martian atmosphere for a few hundreds of years because it quickly breaks down to form water and carbon dioxide. Something is refilling the atmosphere with methane but what? TGO will also look at potential sources of other trace gases such as volcanoes and map the planet’s surface. It can also detect buried water-ice deposits, which, along with locations identified as sources of the trace gases, could influence the choice of landing sites of future missions. The orbiter will also act as a data relay for the second ExoMars mission — a rover and stationary surface science platform scheduled for launch in May 2018 and arriving in early 2019. On October 16, when the spacecraft is still 559,000 miles (900,000 kilometers) from the Red Planet, the Schiaparelli lander will separate from the orbiter and three days later parachute down to the Martian surface. The orbiter will take measurements of the planet’s atmosphere (including methane) as well as any atmospheric electrical fields. Mars is a popular place. There are currently five active orbiters there: two European (Mars Express and Mars Odyssey), two American (Mars Reconnaissance Orbiter and MAVEN), one Indian (Mars Orbiter Mission) and two rovers (Opportunity and Curiosity) with another lander and orbiter en route! The cooperative Euro-Russian ExoMars 2016 expedition is now en route to the Red Planet after successfully firing its upper stage booster one final time on Monday evening, March 15, to blast free of the Earth’s gravitational tug and begin a 500 million kilometer interplanetary journey in a bold search of indications of life emanating from potential Martian microbes. The vehicle is in “good health” with the solar panels unfurled, generating power and on course for the 500 Million kilometer (300 million mile) journey to Mars. “Acquisition of signal confirmed. We have a mission to Mars!” announced Mission Control from the European Space Agency. The joint European/Russian ExoMars spacecraft successfully blasted off from the Baikonur Cosmodrome in Kazakhstan atop a Russian Proton-M rocket at 5:31:42 a.m. EDT (0931:42 GMT), Monday, March 14, with the goal of searching for possible signatures of life in the form of trace amounts of atmospheric methane on the Red Planet. The first three stages of the 191-foot-tall (58-meter) Russian-built rocket fired as scheduled over the first ten minutes and lofted the 9,550-pound (4,332-kilogram) ExoMars to orbit. Three more firings from the Breeze-M fourth stage quickly raised the probe into progressively higher temporary parking orbits around Earth. But the science and engineering teams from the European Space Agency (ESA) and Roscosmos had to keep their fingers crossed and endure an agonizingly long wait of more than 10 hours before the fourth and final ignition of the Proton’s Breeze-M upper stage required to break the bonds of Earth. The do or die last Breeze-M upper stage burn with ExoMars still attached was finally fired exactly as planned. The probe was released at last from the Breeze at 20:13 GMT. However, it took another long hour to corroborate the missions true success until the first acquisition of signal (AOS) from the spacecraft was received at ESA’s control centre in Darmstadt, Germany via the Malindi ground tracking station in Africa at 5:21:29 p.m. EST (21:29 GMT), confirming a fully successful launch with the spacecraft in good health. It was propelled outwards to begin a seven-month-long journey to the Red Planet to the great relief of everyone involved from ESA, Roscosmos and other nations participating. An upper stage failure caused the total loss of Russia’s prior mission to Mars; Phobos-Grunt. “Only the process of collaboration produces the best technical solutions for great research results. Roscosmos and ESA are confident of the mission’s success,” said Igor Komarov, General Director of the Roscosmos State Space Corporation, in a statement. The ExoMars 2016 mission is comprised of a joined pair of European-built spacecraft consisting of the Trace Gas Orbiter (TGO) plus the Schiaparelli entry, descent and landing demonstrator module, built and funded by ESA. “It’s been a long journey getting the first ExoMars mission to the launch pad, but thanks to the hard work and dedication of our international teams, a new era of Mars exploration is now within our reach,” says Johann-Dietrich Woerner, ESA’s Director General. The cooperative mission includes significant participation from the Russian space agency Roscosmos who provided the Proton-M launcher, part of the science instrument package, the surface platform and ground station support. The Trace Gas Orbiter (TGO) and Schiaparelli lander are speeding towards Mars joined together, on a collision course for the Red Planet. They will separate on October 16, 2016 at distance of 900,000 km from the planet, three days before arriving on October 19, 2016. TGO will fire thrusters to alter course and enter an initial four-day elliptical orbit around the fourth planet from the sun ranging from 300 km at its perigee to 96 000 km at its apogee, or furthest point. Over the next year, engineers will command TGO to fire thrusters and conduct a complex series of ‘aerobraking’ manoeuvres that will gradually lower the spacecraft to circular 400 km (250 mi) orbit above the surface. The science mission to analyse for rare gases, including methane, in the thin Martian atmosphere at the nominal orbit is expected to begin in December 2017. As TGO enters orbit, the Schiaparelli lander will smash into the atmosphere and begin a harrowing six minute descent to the surface. The main purpose of Schiaparelli is to demonstrate key entry, descent, and landing technologies for the follow on 2nd ExoMars mission in 2018 that will land the first European rover on the Red Planet. The battery powered lander is expected to operate for perhaps four and up to eight days until the battery is depleted. It will conduct a number of environmental science studies such as “obtaining the first measurements of electric fields on the surface of Mars that, combined with measurements of the concentration of atmospheric dust, will provide new insights into the role of electric forces on dust lifting – the trigger for dust storms,” according to ESA. The joint European/Russian ExoMars spacecraft successfully launched early this morning from the Baikonur Cosmodrome in Kazakhstan atop a Proton-M rocket at 5:31:42 a.m. EDT (0931:42 GMT), Monday, March 14, with the goal of searching for signs of life on the Red Planet. After settling into orbit around Mars, it’s instruments will scan for minute signatures of methane gas that could possibly be an indication of life or of nonbiologic geologic processes ongoing today. The spacecraft is currently circling in a temporary and preliminary parking orbit around Earth following liftoff of the 191-foot-tall (58-meter) Russian-built rocket under overcast skies – awaiting a critical final engine burn placing the probe on an interplanetary trajectory to Mars. The 9,550-pound (4,332-kilogram) ExoMars 2016 spacecraft continued soaring to orbit after nominal firings of the Proton’s second and third stages and jettisoning of the payload fairing halves protecting the vehicle during ascent through Earth’s atmosphere. A total of four more burns from the Breeze-M upper stage are required to boost ExoMars higher and propel it outwards on its seven-month-long journey to the Red Planet. So the excitement and nail biting is not over yet and continues to this moment. The final successful outcome of today’s mission cannot be declared until more than 10 hours after liftoff – after the last firing of the Breeze-M upper stage sets the probe on course for Mars and escaping the tug of Earth’s gravity. The first three Breeze-M fourth stage burns have now been completed as of about 9:40 am EST, according to ESA mission control on Darmstadt, Germany. The fourth and final ignition of the Breeze-M upper stage and spacecraft separation is slated for after 3 p.m. EDT today, March 14, 2016. The first acquisition of signal from the spacecraft is expected later at about 5:21:29 p.m. EST (21:29 GMT). The ExoMars 2016 mission is comprised of a joined pair of European-built spacecraft consisting of the Trace Gas Orbiter (TGO) plus the Schiaparelli entry, descent and landing demonstrator module, built and funded by the European Space Agency (ESA). The ExoMars 2016 TGO orbiter is equipped with a payload of four science instruments supplied by European and Russian scientists. It will investigate the source and precisely measure the quantity of the methane and other trace gases, present at levels of one percent or far less. On Earth methane can be produced by biology, volcanoes, natural gas and hydrothermal activity. TGO will investigate what makes it on Mars and follow up on measurements from NASA’s Curiosity rover and other space based assets and telescopes. Martian methane has a lifetime of about 400 years, until it is destroyed by solar UV & mixed by atmosphere, says Jorge Vago, ESA ExoMars 2016 principal scientist. The 2016 lander will carry an international suite of science instruments and test European entry, descent and landing (EDL) technologies for the 2nd ExoMars mission in 2018. The 2018 ExoMars mission will deliver an advanced rover to the Red Planet’s surface. It is equipped with the first ever deep driller that can collect samples to depths of 2 meters (seven feet) where the environment is shielded from the harsh conditions on the surface – namely the constant bombardment of cosmic radiation and the presence of strong oxidants like perchlorates that can destroy organic molecules. ExoMars was originally a joint NASA/ESA project. But thanks to hefty cuts to NASA’s budget by Washington DC politicians, NASA was forced to terminate the agencies involvement after several years of extremely detailed work and withdraw from participation as a full partner in the exciting ExoMars missions. NASA is still providing the critical MOMA science instrument that will search for organic molecules. Thereafter Russia agreed to take NASA’s place and provide the much needed funding and rockets for the pair of launches in March 2016 and May 2018. TGO will also help search for safe landing sites for the ExoMars 2018 lander and serve as the all important data communication relay station sending signals and science from the rover and surface science platform back to Earth. ExoMars 2016 is Europe’s most advanced mission to Mars and joins Europe’s still operating Mars Express Orbiter (MEX), which arrived back in 2004, as well as a fleet of NASA and Indian probes. The Trace Gas Orbiter (TGO) and Schiaparelli lander arrive at Mars on October 19, 2016. For the second time in less than three weeks, a major disaster struck the Russian space program when the launch of a Proton-M rocket ended in catastrophic failure about eight minutes after today’s (May 16) liftoff from the Baikonur Cosmodrome in Kazakhstan, resulting in the complete destruction of the Mexican communications satellite payload. The Proton-M rocket initially lifted off successfully at 11:47 a.m. local time (1:47 a.m. EDT, 547 GMT) from the Baikonur Cosmodrome in Kazakhstan, but soon experienced an “emergency situation at 497 seconds into the flight,” according to a brief official statement released by Roscosmos, the Russian Federal Space Agency today, after the mishap. The launch catastrophe was caused by a failure in the rockets Breeze-M third stage, says Roscosmos. It took place during a live broadcast from the agency’s website. A video shows the rocket disappearing into cloudy skies shortly after liftoff. The failure comes just one week after the spinning, out-of-control Russian Progress 59 cargo freighter bound for the ISS met its undesired early demise when it fell uncontrolled from orbit last Friday, May 8, following its botched April 28 launch on a Russian Soyuz-2.1A carrier rocket, also from Baikonur – as reported by Universe Today – here, here, and here. The Proton-M carrier rocket was lofting the Mexsat 1 communications satellite, also known as Centenario, under a contract with the Mexican government. “The failure happened on the 497th second of the flight, at an altitude of 161 kilometers [100 miles]. The third stage, the booster vehicle and the spacecraft almost completely burned up in the atmosphere. As of now there are no reports of debris reaching the ground,” the agency said in a statement. The Breeze-M third stage was to loft Mexsat 1 to its destination in geostationary orbit over 22,000 miles above Earth at 113 degrees west longitude. The 58.2 m (191 ft) tall Proton rocket is built and operated by Khrunichev State Research and Production Space Center and marketed by International Launch Services (ILS). After reaching an altitude of about 161 km (100 mi) the rocket and Mexsat 1 payload fell back to Earth and burned up over the Chita region of Russia, which is located south west of the Siberian Baikal region, said the Russian News agency TASS. “The rocket and its payload, a Mexican communication satellite, burned up in the atmosphere,” according to a report by Sputnik International, a Russian News agency. At this time, local residents have not reported or claimed anything regarding possible debris and there is no information about casualties or destruction, TASS noted. Mi8 helicopters from Russia’s Emergencies Ministry have been dispatched to the area to look for any debris. The 5.4 ton Mexsat 1 communication satellite was built by Boeing Satellite Systems International for the Mexican government’s Ministry of Communications and Transportation, the Secretaria de Comunicaciones y Transportes (SCT). The Breeze-M failure occurred about 1 minute prior to separation of the third stage from Mexsat 1. “The emergency situation happened at 08:56 Moscow time, one minute to the scheduled separation of the Breeze-M booster and the Mexican MexSat-1 space apparatus,” TASS reported. A malfunction with the third stage steering engine may be the cause of the doomed flight. “A preliminary reason of the accident with Proton is a failure of the steering engines of the third stage,” sources told TASS. Exactly one year ago, another Proton rocket crashed at a similar point when the third stage engines failed during the Proton launch of Russia’s advanced Express-AM4R satellite. “Khrunichev and International Launch Services (ILS) regret to announce an anomaly during today’s Proton mission,” ILS said in a statement issued after the launch failure. ILS said an accident investigation board has been appointed to determine the cause of the failure and recommend corrective actions. “A Russian State Commission has begun the process of determining the reasons for the anomaly. ILS will release details when data becomes available,” said ILS. They hope to return the workhorse Proton to flight as soon as possible. This was the eleventh failure of the Proton-M rocket or Breeze-M upper stage in 116 launches since the inaugural liftoff in April 2001. Mexsat 1 had a planned lifetime of 15 years. It was to provide mobile satellite services to support national security, civil and humanitarian efforts and will provide disaster relief, emergency services, telemedicine, rural education, and government agency operations. Media reports indicate it was insured for about $390 million. About nine minutes after launching towards space, a Russian Proton rocket reportedly crashed Friday (May 16), destroying an advanced satellite being carried on board. The incident happened about 540 seconds after liftoff, after the events of the video shown above. Russian news site RT (among others) reported that the rocket and Express-AM4R mainly burned up in the atmosphere, meaning no physical damage would be caused to the ground. But this failure marks the latest of several for the Russian rocket type in recent years. “The exact cause is hard to establish immediately; we will be studying the telemetry. Preliminary information points to an emergency pressure drop in a steering engine of the third stage of the rocket,” said Oleg Ostapenko, the head of the Russian Federal Space Agency (Roscosmos), in a quote cited in RT. The third stage is called a Breeze-M and reportedly experienced an emergency engine shutdown after the rocket veered on to a different trajectory than it was supposed to. Proton launches have ceased at the Baikonur Space Center in Kazakhstan pending an investigation. The satellite was supposed to provide “TV and radio broadcasting, broadband Internet access, multimedia services, telephony, [and] mobile communications,” according to the Russian Satellite Communications Company. Traveling through low-Earth orbit just got a little more dangerous; a drifting Russian Breeze M (Briz-M) rocket stage that failed to execute its final burns back on August 6 has recently exploded, sending hundreds of shattered fragments out into orbit. Russia and the U.S. Defense Department (JFCC-Space) have stated that they are currently tracking 500 pieces of debris from the disintegrated Breeze M, although some sources are saying there are likely much more than that. After a successful liftoff via Proton rocket on August 6 from the Baikonur Cosmodrome, the Breeze M upper stage’s engines shut off after only 7 seconds as opposed to the normal 18 minutes, leaving its fuel tanks filled with 10 to 15 tons of hydrazine and nitrogen tetroxide propellants. Its payloads, the Indonesian Telkom 3 and the Russian Express-MD2 communications satellites, were subsequently deployed into the wrong orbits as the Breeze M computer continued functioning. Although originally expected to remain intact for at least another year, the rocket stage “violently disintegrated” on October 16. Evidence of the explosion was first observed by astronomer Robert McNaught at Australia’s Siding Springs Observatory, who counted 70 fragments visible within the narrow field-of-view telescope he was using for near-Earth asteroid observations. The exact cause of the explosion isn’t known — it may have been sparked by an impact with another piece of space junk or the result of stresses caused by the Breeze M’s eccentric orbit, which varied in altitude from 265 to 5,015 kilometers (165 miles to 3,118 miles) with an inclination of 49.9 degrees. This was the third such breakup of a partially-full Breeze M upper stage in orbit, the previous events having occurred in 2007 and 2010, and yet another Breeze M still remains in orbit after a failed burn in August 2011. Most of the latest fragments are still in orbit at altitudes ranging from 250 to 5,000 km (155 to 3,100 miles), where they are expected to remain.